Hello, Radiant One and welcome back. It’s been almost been 3 to 4 weeks and I have been taking – I’ve been diving deep into myself, this cave. I’ve been taking time off for the new year and now I am back. We’re back and it’s a bright new year 2019. If I haven’t said it before I want to make sure that you hear me say, “Happy New Year.” I wish you the most magnificent 2019. I pray that it may be the most wonderful fantastic year for you as well as for your business. Since we are just coming up in the middle of January, I know that many of you are deep in probably planning or mapping or scheduling out your year and I want to make sure that you don’t do it without this one thing as well. That one thing is: vacation. I want to make sure that as you go through your planning, your mapping out, however you do your scheduling or mapping/planning for the year, I want to make sure that you also add vacation time. Because vacation time is so, so important and coming back from or entering a new year, you are probably bursting with energy and you’re so ready to tackle everything that it can be easy to kind of forget that there will be times during our journeys in our businesses where we need to take time off, where we need to regroup, rethink, recharge, and energize yourself. I know that you being a soul-driven, heart-based entrepreneurs, spiritual entrepreneur, most likely you have rituals in place. You have practices in place that ensure that you on a daily basis fill yourself up, that you energize yourself and recharge yourself. However, I also know that because you have a heart that is big and full and beats for the world, very often you tend to take on, or we tend to take on a lot of things. That’s something that I truly do believe in. That’s why I on a daily basis have meditation practices and silence practices in place. But there’s also something in the taking off a considerable amount of days and not just have it be a day or a weekend but actually have it be weeks and perhaps even months. As I was preparing this episode, I was contemplating the cultural differences because I was born and raised in Denmark and I know that the Scandinavian countries and Nordic countries have kind of a different perspective on – I don’t know if I want to call it human life or the way that we live – but I know, for example, that we take or we have as a – I think everyone has about 5-6 weeks of vacation just because that’s how our laws and our systems were set up. Then there are those that have – I know that when I had my corporate career, I think I had about 7 weeks where the last 5 days were for if your child is sick or you get sick or so forth. However, if you don’t have children like I didn’t, then you still get those days. I think that at the end it was about 6-7 weeks. So I understand that for me personally there’s probably a cultural aspect of vacation being necessary. Because I know that the 6-7 weeks is a stark contrast to what it is for example in the US and perhaps in other parts of the world where there seems to be this idea that you have to work 24/7 and not only that but at a wage that is barely a living wage. So I understand that there are some cultural differences so what I mean by this is that if come from a country where vacation is not something that is the norm then you may find that is harder for you or you struggle more with the idea of having or taking vacation without filling yourself up with guilt and shame and wondering if you can do it or whatever. So just be aware of that as you go out and plan. It’s funny because this year when I was – my mapping out of 2019 just flew out of me. It was intuitively and it wasn’t even my intention because I didn’t intend for me to be working during my vacation and I didn’t either. But as I got my calendar up, it just flowed out of me and actually what I realized is that I need to “take more vacation” than I did last year. So this year will probably be in the likes of 8 to 9 weeks of vacation. That just flowed out of me when I started mapping out my year. So I want to inspire you to map out. I want to share a story with you because this is a client story and as always when I share client stories, I’ve been given expressed consent by my clients to share them with you so that you may find inspiration in it and perhaps even empowerment and motivation. So I have one client who, when we first started working together, she was – and that’s a story for another day – but she was in a job that she didn’t really like and she wanted to transition from that job into a freelance position and expand her business as well, which was something that we worked on. In uncovering and clarifying her goals and her dreams, what came up was that she really wanted to take 6 weeks of vacation in summertime to be with her girls and really be with her husband. The first year, that was not possible but we knew that that was a goal we were striving for – I don’t like the word, striving. That we were working towards with her. I think it went from 4 to 6 and I think even perhaps even to 6 to 7 weeks and what we did was – you know, if you’re in business and you want to take off a big chunk of vacation, of course you have to ensure that your business is up and running. You have to ensure that either you have money coming in before or after or even during. You can do that if you have an online business and have online products. Then money can be flowing into your accounts even during your vacation. So we implemented a strategy where we made sure that her clients were aware of when she was going on vacation. They were able to book her and have their things get done before she went on vacation. So that’s the first thing we did. The second thing we did was we created an offer for her clients. It was a very good deal that meant that she had – basically, they paid up front and it would be delivered – she would start working on it when she came back from her vacation. What that meant was deep security. She’s someone who really wants to have about 3 to 4 months of income or pay in her account so that, let’s say she hits a dry spot, she knows that she’s taken care of for a very long time. To be very clear, she’s never needed those 3 to 4 months because she has always got clients coming in and work coming in. But still it was there. It was necessary for her to feel safe and secure and that’s of course necessary if you’re running your own business. Like I said, we created an offer and with that offer, she had clients. There was only a certain amount of clients who could book this offer and she sold it out. That meant that when she left for her first vacation – I think for her first 6-week vacation – it meant that she was able to rest securely, sleep at night knowing that when she came back from her vacation, she had work to do but there was money in her account and she could just keep going. So that’s something that is possible with the right ideas, with the right strategy, and with the right set-up of course. I want to make sure that they add vacation and sometimes we have different – if you have children, there’s different school years. I have clients where the school year is different because either they’re either in the Middle East or in the US or here in Denmark. So it changes; it varies. Of course, you can schedule it accordingly to that and make sure that’s in place but I want to make sure that somehow, some way you are going to schedule vacation. Finally, I want to say if you’re thinking that you can’t afford vacation – and when I say vacation, I’m not talking about you jumping on a plane and going to the Caribbean and staying there for 3 months (unless that’s what you want to do). When I say vacation, I mean just time off from your business where you’re not working, where you have an autoresponder set up to let people know that you’re on vacation and you won’t be responding to emails or you have your assistant take care of your emails and if there is anything that is really, really important then of course they can maybe get in touch with you. So it’s not about glitter and glamour – it’s about honoring yourself. This is for your well-being as well as for the well-being of your business because you are the core. You are the heart. You are the meat and the soul of your business. So if you run dry, your business runs dry so it’s important to fill that up and take time off. The final thing I want to say is that if you’re someone who thinks that you cannot take vacation, you’re the one who needs to take vacation. Because if you’re stuck in a mindset of being unable to take vacation, chances are that you’re running around like a headless chicken, doing far too much and pushing and forcing and coercing. That’s not fun place to be. I think it was actually – I’m not sure if it was the Dalai Lama or something but I heard it about meditation where it’s said that if you don’t think that you have 20 minutes to meditate, you need to do an hour. I would say the same with vacation. If you feel like you can’t take a vacation, if you can’t afford a vacation – and, again, when I say afford I’m not talking about splurging or maxing out your credit cards. I’m talking about simply taking time off from your business to just be with you. I know I’ve said finally a couple times – I also want to say it doesn’t necessarily mean that you go into a cave or you have to work on yourself. Not even that. The vacation or the time that I just took off, I would love to tell you that I was working on myself. I did do some slight internal personal development work but most of my vacation was spent in bed in my pajamas watching Netflix, bingeing crappy TV shows, and just sleeping in, staying up late, and just enjoying it, enjoying not doing anything at all which is what at the end of it of course then makes me even juicier and even more excited about coming back. This week is actually the first week back with my clients and I can’t wait to see them! I can’t wait to hear what’s been going on and what’s been coming up and I can’t wait to begin mapping out their years and filling their calendars with the most magnificent wonderful offerings, programs, services, and products. Finally, finally – if you’re someone who wants to be supported as you create a business that allows for you to take vacation, if you want to be supported as you structure and organize it in a way so that this is possible and you feel comfortable, secure, and safe in taking vacation, I am open for business. Go ahead and apply for your free discovery session here. 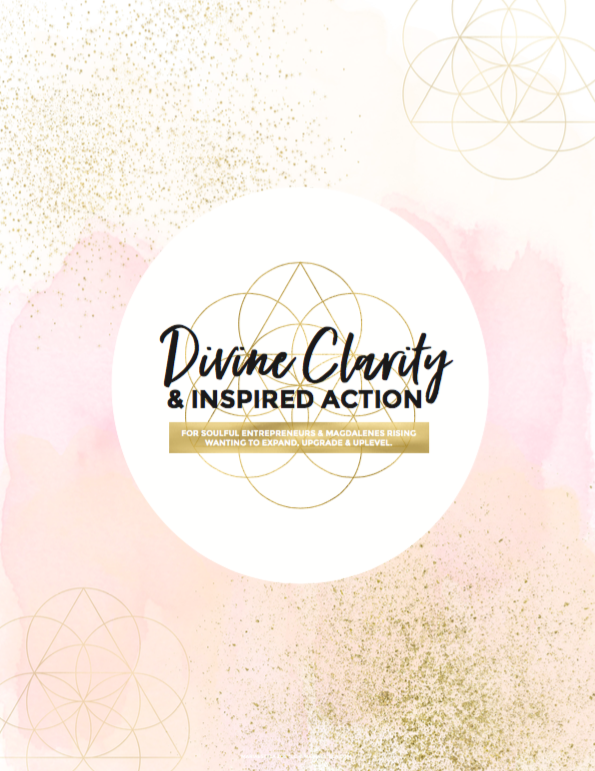 I am taking applications and I would love to sit in sacred session with you to work on creating or making real your dreams. That is all I have for you today. I love you. Take care.